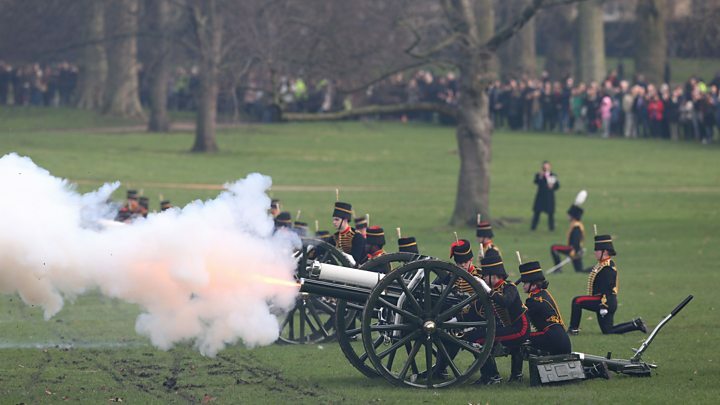 A 41-gun salute has been fired in London's Green Park to mark the Queen's 65 years on the throne. Gun salutes also took place in Cardiff, Edinburgh and York. The Queen has become the first British monarch to reach a sapphire jubilee, after becoming the UK's longest-reigning monarch in 2015, aged 89. A portrait of the Queen by British photographer David Bailey has been reissued for the anniversary. In the photo, the Queen wears sapphire jewellery given to her by King George VI as a wedding gift in 1947. The portrait was among a series taken by Bailey in 2014, with one released for the Queen's 88th birthday that year. In the portrait, the Queen, who is now 90, wears a necklace made of 16 large, oblong sapphires surrounded by diamonds, with a matching pair of drop earrings. Over the years, she has added to the gifts from her father with a tiara and a bracelet to complement the original jewellery. It is tradition for the Queen to spend the Accession Day - as the anniversary of the day she became monarch is officially known - in private at her Sandringham Estate, in Norfolk, and return to Buckingham Palace a few days later. King Sobhuza II of Swaziland reigned for 82 years - the longest verifiable reign of any monarch in recorded history. He led Swaziland through independence until his death in 1982. King Bhumibol Adulyadej of Thailand had ruled for 70 years when he died last October. He began his reign aged just 18 years old. Franz Joseph I was Emperor of Austria and King of Hungary, Croatia and Bohemia for 67 years until his death in 1916. His nephew was Archduke Franz Ferdinand, who was assassinated in 1914. King Louis XIV of France reigned for 72 years before his death in 1715. He became king, aged four, after his father's death. Prime Minister Theresa May offered her congratulations, hailing the Queen as "truly an inspiration to all of us". The prime minister said: "I know the nation will join with me today in celebrating and giving thanks for the lifetime of service Her Majesty the Queen has given to our country and to the Commonwealth." Mrs May said it was "a testament to her selfless devotion to the nation" that the Queen had made clear she did not want official celebrations to mark the historic milestone. Longevity for a hereditary head of state has brought many milestones. She is Britain's longest reigning monarch, having overtaken her great great grandmother, Victoria, in 2015. Today, after 23,742 days on the throne, it's the start of the first sapphire jubilee in British history. For the Queen, it's a moment for contemplation rather than celebration - as it is also the anniversary of her father's death. In the coming months and years, she will, inevitably, do less and other royals will take on more - most notably Prince William, once he finishes his job as an air ambulance pilot in the summer. The 90-year-old working monarch has another significant moment on the horizon. In November, she and Prince Philip will mark 70 years of marriage. In London, royal gun salutes commemorated the occasion across the capital. A 41-gun salute was fired by the King's Troop Royal Horse Artillery in Green Park at midday and a 62-gun salute by the Honourable Artillery Company was fired at the Tower of London at 13:00 GMT. Larger-scale jubilee celebrations are expected to be reserved for the Platinum Jubilee in 2022, when the monarch will mark 70 years.